This isn’t another piece about standing around and looking at another monumental building or historic architecture, taking a picture and claiming “I was here.” Or eating at the most trendy restaurants or even going to the newest outdoor mall… Everyone does that in every city and while it is cool to hit all the “it” spots, I want to do things in new places. You see I’m a New England native and migrated to Columbus about 5 years ago and this city has me hooked! This list is by no means exhaustive but just a peek into what Columbus has to offer. So let’s begin! Every June The Muirfield Village Golf Club hosts the memorial tournament at The Jack Nicklaus Signature Golf Course. This course is designed specifically for spectators to experience an unprecedented view of the course. If you’re not a golf fan you can still enjoy the event by checking out all the latest summer fashion trends the Dublin housewives are sporting from their fabulous floppy hats to their cool and breezy sundresses. When the tourney has retired for the evening continue your leisure and recreation over at the Bogey Inn, the Dub Pub, or a private party at one of the luxurious residence of Dublin- invite only. It no secret Columbus is the third leading city in the country for high-end fashion. If you’re a fashion enthusiast the launch party is a great way to meet new designers, models, photographers, makeup artists, hair stylists, creatives, etc and see some of the new trends for fashion week in October. It isn’t summer unless you’ve enjoyed a ballpark frank and America’s favorite pastime! The Columbus Clippers play at the iconic Huntington Ball Park in the Arena District. Tickets are inexpensive and a great activity to bring the whole family to on a breezy summer evening! Whether you’re a season pass holder or a day go-er there is so much for everyone! 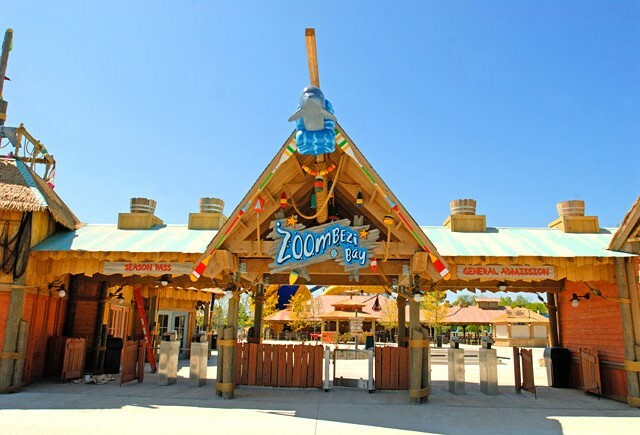 When hitting up the zoo & water park make sure to pick up your Zoo-It-All wrist bands for $9.99 in addition to your admission to have access to all of the rides unlimited as well as Stingray Bay – an interactive play space where you can touch and see the stingrays up close. At 11am head over to The Heart of Africa, the zoo’s newest region and feed the giraffes! After you’ve had your fill of animals. Eat your packed lunch at zoo since it is permitted and theme park prices can be steep. Outside food and drinks are NOT permitted into the water park area and they will check bags. Cool off in the lazy river, wave pool and ride the water slides in the summer afternoon heat; as dusk settles in catch one of the Dive In Movies in their wave pool. Take a day trip down to Logan, Ohio about 45 minutes south east of down town Columbus to Hocking Hills State Park. There are incredible hiking trails with beautiful landscapes of waterfalls and hidden caves to discover. You can also rent kayaks, canoes, tubes or rafts for the day and explore the riverbanks of the Hocking River. Are you interested in seeing downtown Columbus from a unique perspective? Rent a COGO Bike! These bicycles are located throughout downtown and a fun and affordable way to experience all that Columbus has to offer. Just make sure to dock every ½ hour at a new location! A Weekend Getaway in a Tree House! You’ve day dreamed about staying in all the gorgeous unique places you’ve scrolled through on AirBnB during that 3 o’clock hour at work. Now let’s make it a reality by booking your weekend getaway at The Mohicans! They’re just a short 1.5 hours drive away from Columbus in quaint, rural northeast Ohio. This business has really brought the idea of experiencing the great outdoors to the next level! Rent one of three different luxury-styled tree houses, one of which is crimson red with white trim, complete with cathedral windows and is my personal favorite. Perfect for peace and relaxation. 8. Red, White & BOOM! Every Independence Day our city hosts an exciting event with food, fun and of course fireworks! Streets shut down and local restaurant owners and food truck vendors line the streets with their delectable dishes ready to serve to all of the Cbus’ foodies. There are parades, a children’s park with face painting & inflatables, multiple stages with live music of local artists, after parties and most importantly and my favorite the grand finale firework display! For the best seat in the house attend a rooftop party or head over to the main street bridge by Milestone 229 to grab some night photographs of the city skyline and the fireworks! Rated as the world’s best amusement park and known as the roller coaster capital of the world this is a definite must if you’re a thrill seeker visiting Ohio. It is located in Sandusky, Oh about 2.5 hrs away from Columbus and worth the drive for an epic adventure. 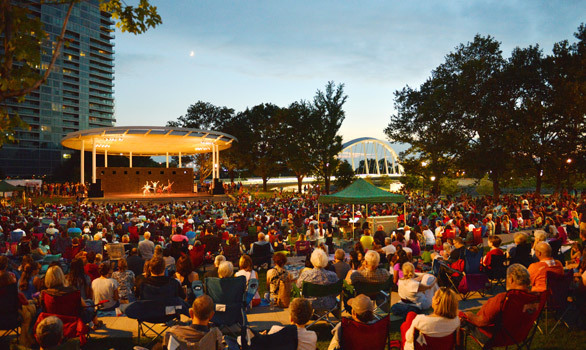 “Grab a blanket and enjoy a picnic under the stars” as you watch various artists from music to dance perform at the Bicentennial Park Performing Arts Pavilion. This is a free event and a great way to spend time with family and friends. Make sure to get there early enough to get a good seat! It’s Farmer Market Season! Everyone get ready for fresh fruits, veggies, cheese and an array of other locally made food products. Discover over 30 different markets right here in Columbus, my personal favorite being the Farmer’s Market in Grandville! The mountainous views and old architecture on Main St. create an incredible atmosphere that is reminiscent of old New England towns. Rides, concerts & fair food, Oh My! From July 29th-August 9th come out to the fair, ride the rides, eat cotton candy, and funnel cake!! There are a host of attractions for every age! Experience an African safari on 9,000 plus acres! The Wilds offer a variety of Safari tours from open-air transport to ziplining at sunset. This adventure is great for the thrill-seeking, animal lover. They are located east of Columbus just a little over an hour away. Looking for a different kind of girl’s night?! Get dress up and head out to Hollywood Casinos to play the slot machines or the Black Jack table! The interior design is reminiscent of Gatsby’s era and great for a selfie or two. Ok so I know I said you wouldn’t be staring at architecture but there is something oh so quaint about historic German Village, wander around the winding brick-laden streets and discover some hidden gems! Grab breakfast at Pistacia Vera, a chic little bakery & coffee shop and then stroll on down to the Book Loft to discover how this old house was converted into the most unique used-book store you’ve seen. Don’t forget to pick up your lavender cupcakes from Kittie Cakes and finally enjoy a refreshing glass of white wine at Lindey’s Restaurant & Bar. What can I say, these guys are an incredible band!! LDNL is a cover band that performs their music live straight from popular Hip Hop songs and the top 40 charts. If you’re looking for a good dance party come out to one of their shows! You won’t sit down all night! If you find yourself around Columbus for the summer and looking for a new and exciting hobby to learn, I suggest sailing! Columbus has three different clubs to choose from and offers 3-4 week sessions two days a week rain or shine! So bring your lifejacket and a willingness to learn and you’re already on your way to becoming a sailor! Ok so you want the skinny on where to eat in the 614? It’s not where you think… Columbus was named by Forbes Magazine as one of the top 5 Secret Foodie Cities in the country! So let me tell you where the locals go for authentic good eats! Vietnamese: Indochine Café is family owned and operated and this hilarious family will have you feeling like family by the time you leave! I am regular and they know my order!! Ethiopian: Lalibella Restaurant is family owned and operated establishment serving the best African cuisine! Middle Eastern: Nazareth Restaurant & Deli is family owned and operated and this place has the best Arabic coffee and falafel!! Mexican: Ok this one is a toss up between El Tacoriendo (family owned & operated) and Nada (a trendy new restaurant found in the arena district.) Both offer incredible food choices and portions but with completely different styles. Vegan/Organic: Portia’s Café is family owned & operated and unprecedented by any other. Portia’s offers incredible raw, organic, vegan, and gluten-free choices. Hearty portions, rich flavors, and you will definitely not leave hungry! Winery: Cooper’s Hawk Winery & Restaurants is a small chain originating in Chicago. They offer incredible wine selections made exclusively from their wineries. My personal favorite and a must try is the rhubarb wine. It will change you life! Late Night Snack/Street Food: Doughby’s is where it’s at! Located on N. High St it is the perfect pit stop for a handmade calzone or mouth watering cheesy bread. Columbus is home to some of the best festivals in central Ohio from the arts, to cultural to food to fashion to music etc. FMMF (Fashion Meets Music Festival) is Columbus’ newest addition to the festival scene and jammed pack full of different genres of music paired with up and coming local fashion designers. Rules were meant to be broken and you’re allowed one or two selfie passes while visiting this amazing city! Make it count by documenting your “I was here status” in front of the iconic aqua blue wall and orange garage just off of N. High St on W. Poplar St.
Jessy Howard is the CEO &	Founder	of The Howard Brand,	a fine art	wedding	and	lifestyle	photography	house based	out	of Columbus,	OH	with	availability worldwide. She has	a driving	passion	for	people	and	sharing their	stories as well as an unprecedented eye	when it comes	to her work in photography. She possesses	the innate ability to	transmute her raw imagination	and	subconscious into physical	tangible	still-frames that creates a juxtaposition of carefully	calculated style and poise in her photographs while simultaneously	capturing the	moment	and	movement of the	scene as	it unfolds. You can	book her at TheHowardBrand.com	and	follow her on	Instagram and Twitter	@TheHowardBrand.